In an effort to try to time our road trip back home from Florida so that we would avoid a major storm that was due to hit the mountains of West Virginia, we stopped at Charleston, South Carolina. We arrived late afternoon and so picture taking was not optimum but I did capture a little of the flavor of the old city as we explored a bit looking for a place to eat. We happened upon Chalmers Street, the longest remaining cobble stone street in the city and just in time to see a horse drawn wagon full of tourists stop at the intersection. The tour guide was explaining that this was one of few streets remaining with the cobble stone surface and that's when we realized that we had stumbled onto the longest. 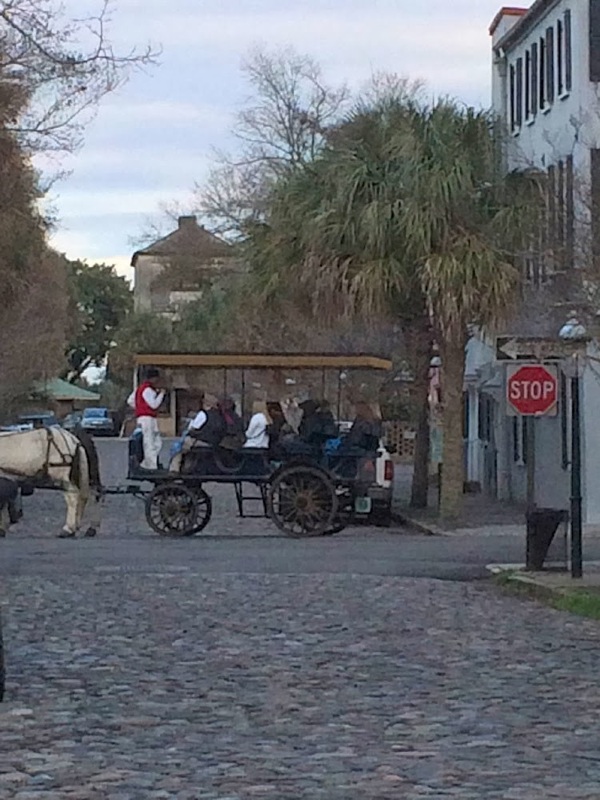 I guess I didn't know quite what to expect of Charleston. Maybe I was looking for more of a New Orleans type look. More of a Victorian look perhaps. 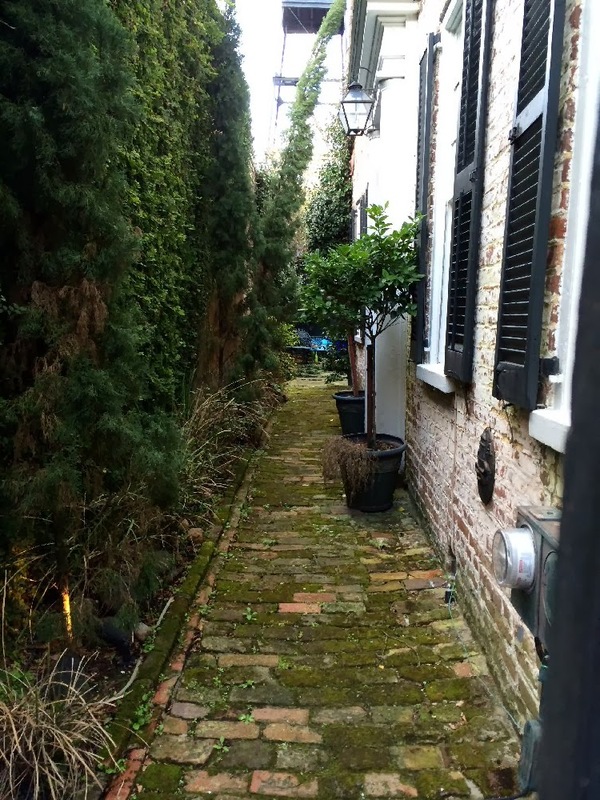 What little I did get to see wasn't exactly what I expected but there were some interesting nooks and crannies like the alleyway we passed where I snapped a photo. Out on the public pier that extended into the Cooper River, people were strolling and swinging in the suspended swings that lined the pier. The sun was setting behind us and the river was taking on a dusky late evening look. 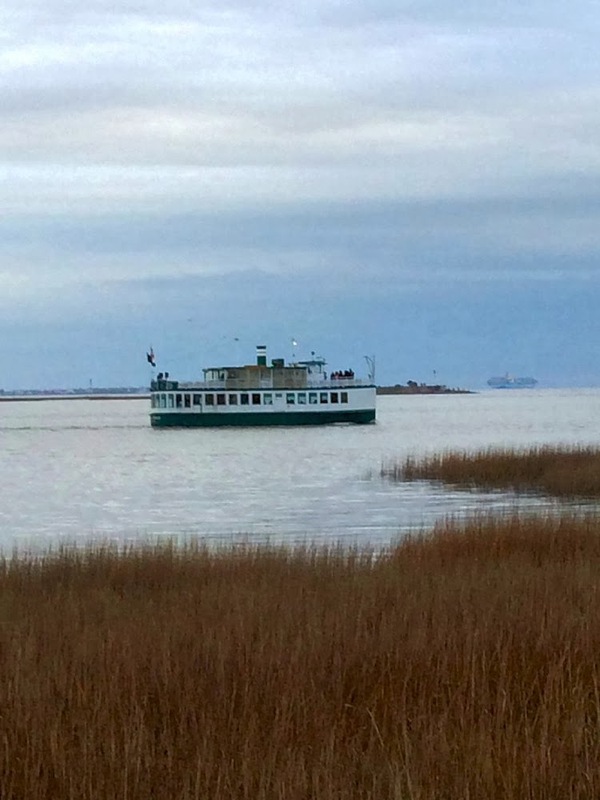 A boat I later learned was the Fort Sumter tour boat was lazying down the river probably on its way to its nighttime berth. It was a pretty picture and we lingered a few moments until we were reminded that we were hungry. Going into Charleston on a Saturday night without dining reservations is not a good idea. We must have checked out a half dozen places before we found one that could seat us before 8 p.m. (we don't eat dinner that late). What we found was a nice place called the Southend Brewery and Smokehouse. I got a wonderful sandwich with smoked turkey, brie, and cranberry sauce while Bob polished off another plate of shrimp and grits, his favorite southern meal. Again, without a plan to explore Charleston we surely missed a lot but decided that if we saw nothing else, we should at least visit Fort Sumter in the morning before leaving to travel further north. Ah, another city to return to. The bucket list never gets shorter.